Big day here in the United States. It’s about two things: Football (Amerian style) and Food. Yep, Super Bowl Sunday is here. Those Baltimore Ravens will take on the San Franciso 49ers. Thousands will watch the game in person, Millions others will watch the game on TV. Millions more will just gather to watch the Super Bowl commercials and eat food, caring not a wit about the game. I’ll do a little bit of all three. I do love me some football food though. A few years ago, before the Krajnak Kid Prodcution line started and I had more time, I would concoct a different meal for every Philadelphia Eagles (my team) game. I prepare the food, then photograph it, then submit it to a Philly sports blog called The 700 Level. I always liked the early 1 p.m. games, because I like shooting food in natural light. Once it got later in the day, and darkness set in, the dishes never looked as good to me. Sunday or Monday night games were the worst. It was a pretty well-received by the readers of the Level. I just couldn’t keep up the schedule once the kids started arriving. I’d be cooking all morning, then trying to shoot the image, then finally sit down to actually watch the game. Sundays are no longer mine to just sit around and watch footbal. And I’m OK with that. 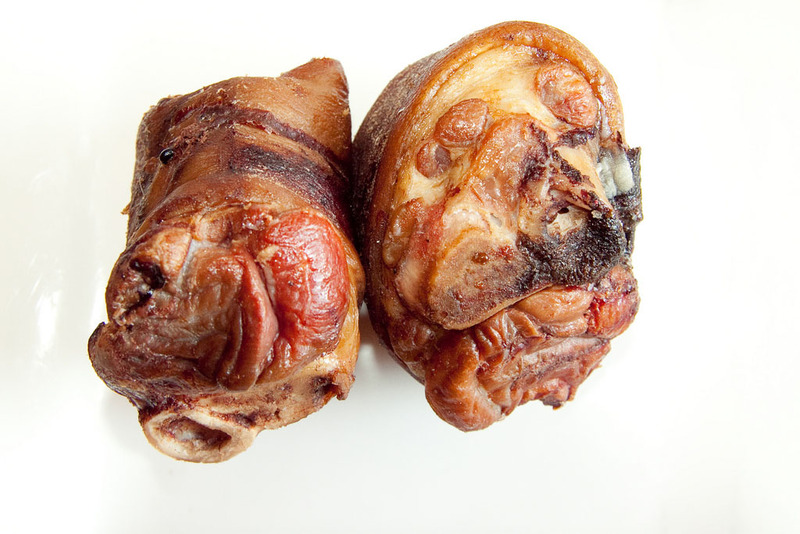 But if you’re one of the millions that will be eating today, or maybe making somethign for the big game, here’s some of my favorites you may want to consider. (You won’t really need the ham hocks, above, unless you decide to make Hoppin’ John’s Rice as a sidedish. 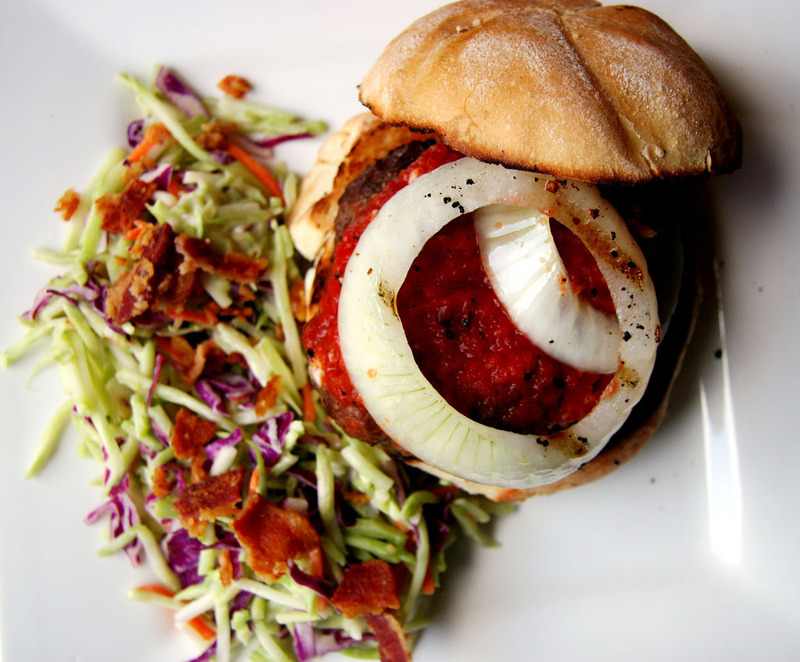 A classic burger with onion, cole slaw topped with bacon. I’m a big ‘slaw fan. 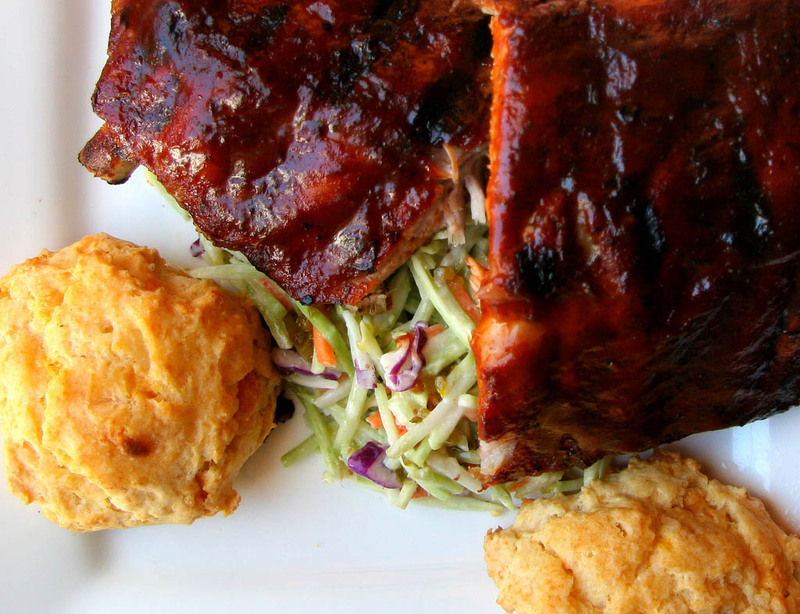 Another classic: Ribs with homemade bourbon BBQ sauce, cole slaw and biscuits. I like my cole slaw to be dressed with a Dijon mustard mayo, rather than just mayo alone. 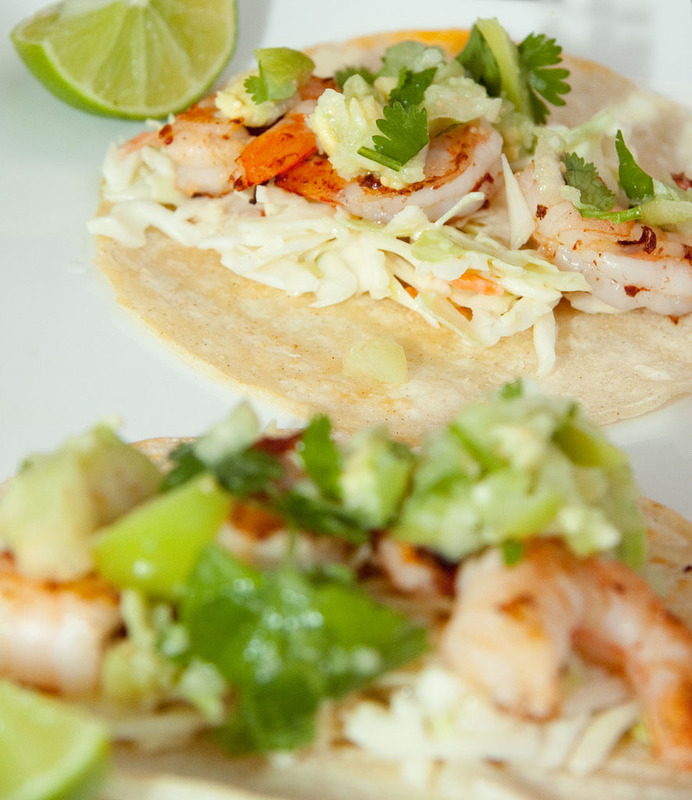 On the lighter side, grilled shimp soft tacos with an avacado salsa. I could eat 10 of these. 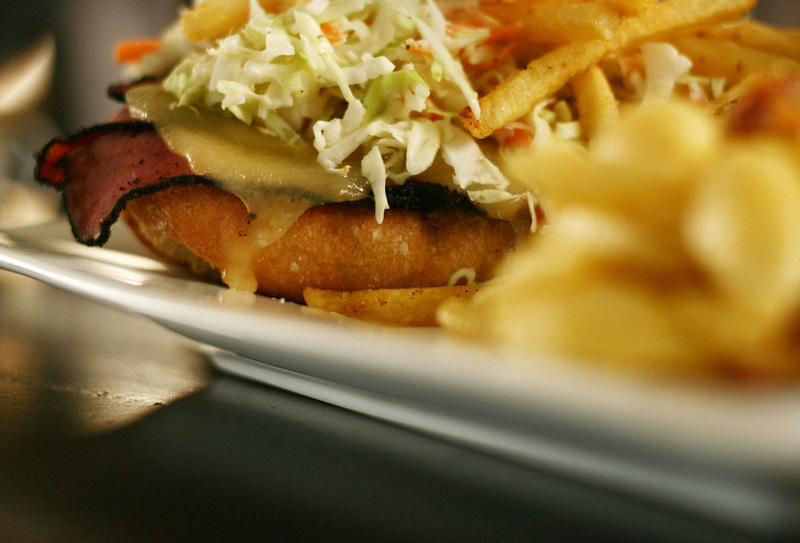 Another classic, and the counter to the lighter fare: Hot pastrami with melted Swiss cheese on a a hard roll. On the side was homemade macarroni and three-cheese cheese, topped with crispy panchetta. And now for something completely different, as Monty Python would say. Want to really stand out with an appetizer? 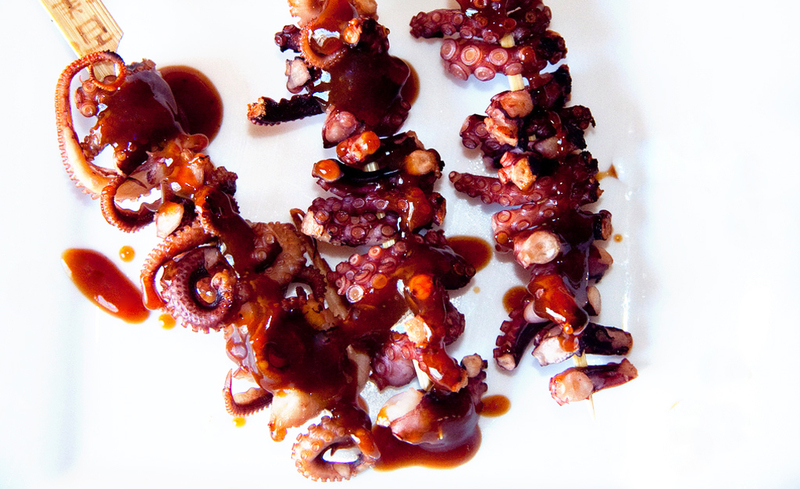 How about grilled octopus in a hoisin sauce. Different, but tasty. But really, the point of Super Bowl Food isn’t eat light or to eat healthy. There will be tons of chili and hot roast beef and Philly Cheese Steaks consumed today. If you really want to stand out, this sandwich will do it. Modeled after a sandwhich at one of my favorite joints in Chicago, The Silver Palm, it’s call The Three Piggy because it takes three kinds of pork: Breaded pork cutlets, smoked ham, smoked bacon. Slice on Gourda cheese. And a fried egg. And an onion ring or two. 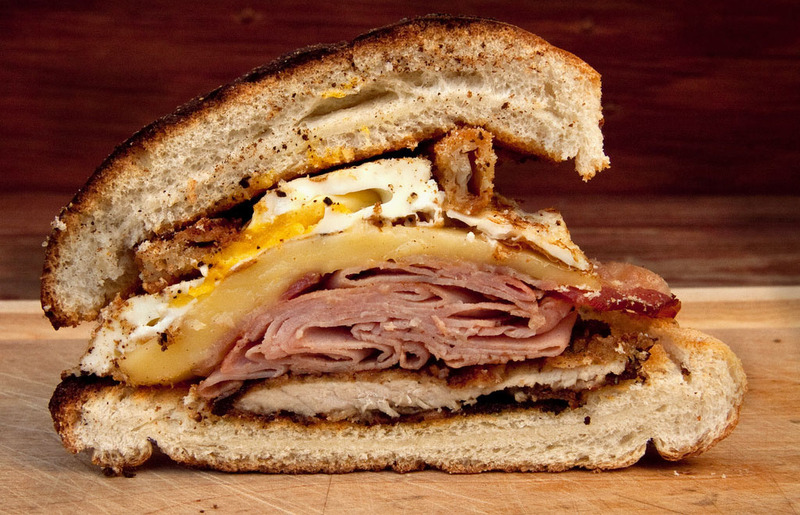 Anthony Bourdain calls it the “greatest sandwich in America.” I can’t say I disagree. You have this in front of you, maybe with that three-cheese Mac’N Cheese, or spicy Waffle Fries… who cares about the game.